^ Kim SY, Park SM, Lee ST (2006). "Apolipoprotein C-II is a novel substrate for matrix metalloproteinases". Biochem. Biophys. Res. Commun. 339 (1): 47–54. doi:10.1016/j.bbrc.2005.10.182. PMID 16314153. 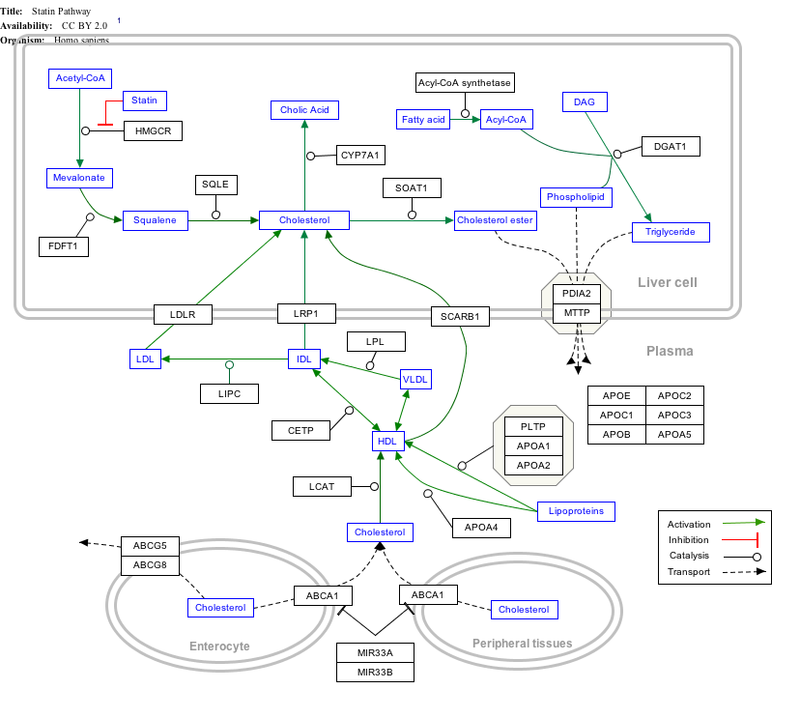 ^ "Entrez Gene: APOC2 apolipoprotein C-II". Jackson RL, Baker HN, Gilliam EB, Gotto AM (1977). "Primary structure of very low density apolipoprotein C-II of human plasma". Proc. Natl. Acad. Sci. U.S.A. 74 (5): 1942–5. doi:10.1073/pnas.74.5.1942. PMC 431048. PMID 194244. Lycksell PO, Ohman A, Bengtsson-Olivecrona G, et al. (1992). "Sequence specific 1H-NMR assignments and secondary structure of a carboxy-terminal functional fragment of apolipoprotein CII". Eur. J. Biochem. 205 (1): 223–31. doi:10.1111/j.1432-1033.1992.tb16772.x. PMID 1555583. Hegele RA, Connelly PW, Maguire GF, et al. (1992). "An apolipoprotein CII mutation, CIILys19----Thr' identified in patients with hyperlipidemia". Dis. Markers. 9 (2): 73–80. PMID 1782747. Crecchio C, Capurso A, Pepe G (1990). "Identification of the mutation responsible for a case of plasmatic apolipoprotein CII deficiency (Apo CII-Bari)". Biochem. Biophys. Res. Commun. 168 (3): 1118–27. doi:10.1016/0006-291X(90)91145-I. PMID 1971748. Bengtsson-Olivecrona G, Sletten K (1990). "Primary structure of the bovine analogues to human apolipoproteins CII and CIII. Studies on isoforms and evidence for proteolytic processing". Eur. J. Biochem. 192 (2): 515–21. doi:10.1111/j.1432-1033.1990.tb19255.x. PMID 2209608. Wei CF, Tsao YK, Robberson DL, et al. (1986). "The structure of the human apolipoprotein C-II gene. Electron microscopic analysis of RNA:DNA hybrids, complete nucleotide sequence, and identification of 5' homologous sequences among apolipoprotein genes". J. Biol. Chem. 260 (28): 15211–21. PMID 2415514. Fojo SS, Lohse P, Parrott C, et al. (1989). "A nonsense mutation in the apolipoprotein C-IIPadova gene in a patient with apolipoprotein C-II deficiency". J. Clin. Invest. 84 (4): 1215–9. doi:10.1172/JCI114287. PMC 329780. PMID 2477392. Jackson CL, Bruns GA, Breslow JL (1986). "Isolation of cDNA and genomic clones for apolipoprotein C-II". Meth. Enzymol. Methods in Enzymology. 128: 788–800. doi:10.1016/0076-6879(86)28106-9. ISBN 9780121820282. PMID 3014272. Fojo SS, Law SW, Brewer HB (1987). "The human preproapolipoprotein C-II gene. Complete nucleic acid sequence and genomic organization". FEBS Lett. 213 (1): 221–6. doi:10.1016/0014-5793(87)81495-3. PMID 3030808. Fojo SS, Stalenhoef AF, Marr K, et al. (1989). "A deletion mutation in the ApoC-II gene (ApoC-II Nijmegen) of a patient with a deficiency of apolipoprotein C-II". J. Biol. Chem. 263 (34): 17913–6. PMID 3192518. Fojo SS, Beisiegel U, Beil U, et al. (1988). "Donor splice site mutation in the apolipoprotein (Apo) C-II gene (Apo C-IIHamburg) of a patient with Apo C-II deficiency". J. Clin. Invest. 82 (5): 1489–94. doi:10.1172/JCI113756. PMC 442713. PMID 3263393. Connelly PW, Maguire GF, Hofmann T, Little JA (1987). "Structure of apolipoprotein C-IIToronto, a nonfunctional human apolipoprotein". Proc. Natl. Acad. Sci. U.S.A. 84 (1): 270–3. doi:10.1073/pnas.84.1.270. PMC 304185. PMID 3467353. Fairwell T, Hospattankar AV, Brewer HB, Khan SA (1987). "Human plasma apolipoprotein C-II: total solid-phase synthesis and chemical and biological characterization". Proc. Natl. Acad. Sci. U.S.A. 84 (14): 4796–800. doi:10.1073/pnas.84.14.4796. PMC 305192. PMID 3474626. Fojo SS, Taam L, Fairwell T, et al. (1986). 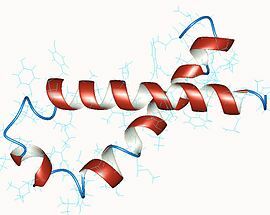 "Human preproapolipoprotein C-II. Analysis of major plasma isoforms". J. Biol. Chem. 261 (21): 9591–4. PMID 3525527. Das HK, Jackson CL, Miller DA, et al. (1987). "The human apolipoprotein C-II gene sequence contains a novel chromosome 19-specific minisatellite in its third intron". J. Biol. Chem. 262 (10): 4787–93. PMID 3558370. Connelly PW, Maguire GF, Little JA (1988). "Apolipoprotein CIISt. Michael. Familial apolipoprotein CII deficiency associated with premature vascular disease". J. Clin. Invest. 80 (6): 1597–606. doi:10.1172/JCI113246. PMC 442428. PMID 3680515. Baggio G, Manzato E, Gabelli C, et al. (1986). "Apolipoprotein C-II deficiency syndrome. Clinical features, lipoprotein characterization, lipase activity, and correction of hypertriglyceridemia after apolipoprotein C-II administration in two affected patients". J. Clin. Invest. 77 (2): 520–7. doi:10.1172/JCI112332. PMC 423374. PMID 3944267. Menzel HJ, Kane JP, Malloy MJ, Havel RJ (1986). "A variant primary structure of apolipoprotein C-II in individuals of African descent". J. Clin. Invest. 77 (2): 595–601. doi:10.1172/JCI112342. PMC 423392. PMID 3944271. Sharpe CR, Sidoli A, Shelley CS, et al. (1984). "Human apolipoproteins AI, AII, CII and CIII. cDNA sequences and mRNA abundance". Nucleic Acids Res. 12 (9): 3917–32. doi:10.1093/nar/12.9.3917. PMC 318799. PMID 6328445. Jackson CL, Bruns GA, Breslow JL (1984). "Isolation and sequence of a human apolipoprotein CII cDNA clone and its use to isolate and map to human chromosome 19 the gene for apolipoprotein CII". Proc. Natl. Acad. Sci. U.S.A. 81 (10): 2945–9. doi:10.1073/pnas.81.10.2945. PMC 345197. PMID 6328478. Human APOC2 genome location and APOC2 gene details page in the UCSC Genome Browser.